Beethoven the Humpback Whale! What’s in a Name? We now have a Humpback that we’ll refer to as “Beethoven” thanks to the great creativity of Maureen and Dave Towers of Seasmoke Whale Watching. Let me explain why we think this nickname is particularly clever. 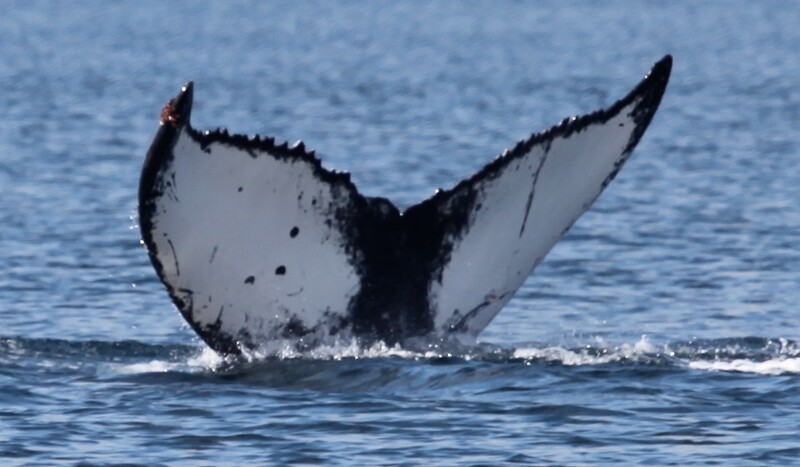 The convention in assigning a British Columbian catalogue number to Humpback Whales is that it reflects the amount of black or white on the underside of the whale’s tail. 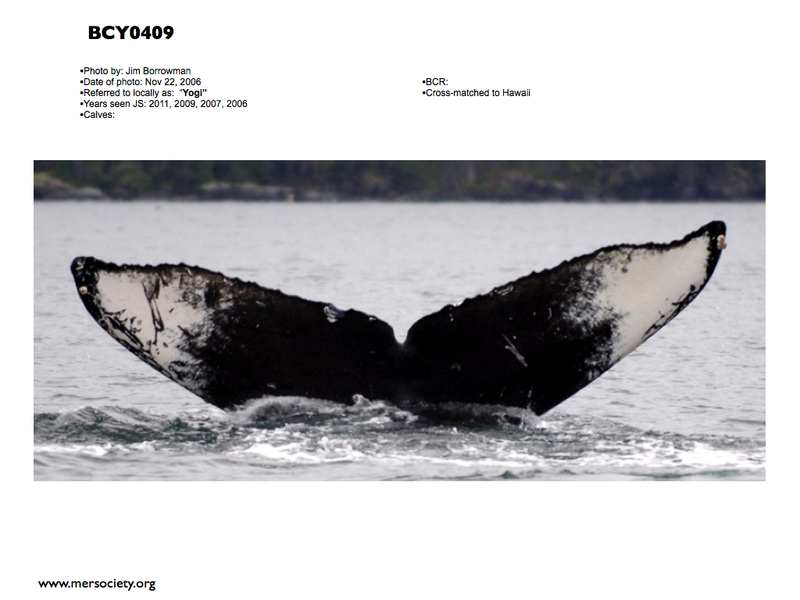 For example, BCZ0004 is the 4th Humpback with a lot of white on his/her tail to be photographed in BC and catalogued. (Note: Up to 2010, these catalogue numbers would be assigned by Fisheries and Oceans Canada (DFO), to which we at the Marine Education and Research Society (MERS) would contribute our ID photos. 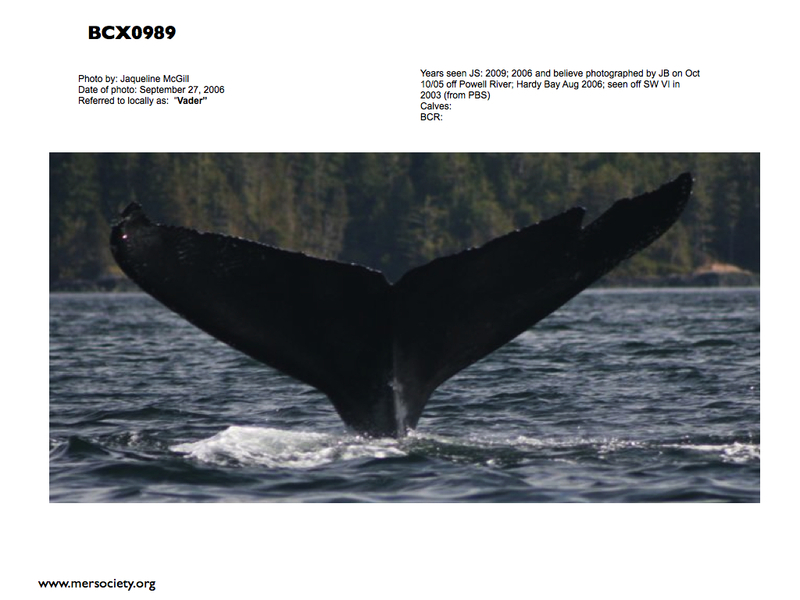 Since 2010, DFO has not catalogued Humpbacks whereby there are now also numbers such as BCZuk2012#3. Please see the end of this blog for an explanation of the “uk”). BCZ0004? It’s not such an easy name to remember is it? So, years ago, we started assigning nicknames to the whales with the guideline that the name should somehow give a clue to the identification of the whale. The hope was that this would help people discern the whales as individuals. For example, I am responsible for giving BCZ004 the nickname “Stripe”. 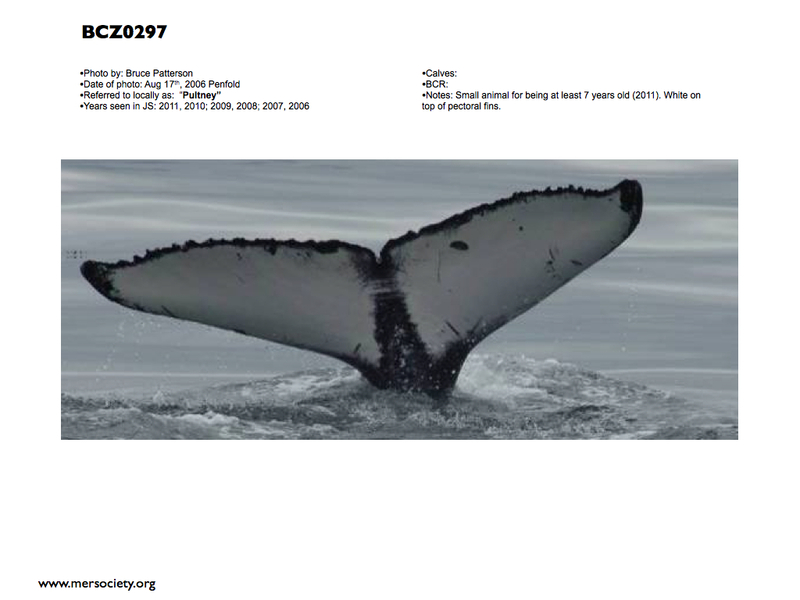 See the ID page from our MERS Humpback catalogue below and determine if you think this name is fitting. Click to enlarge. BCZ0004 aka “Stripe”. ID photos from DFO catalogue and Hildering. Okay , so it’s not a creative name but – it worked! People associated the stripe-like marking with the whale and could identify “Stripe” as an individual. Here you have the female “Chunky”, aka BCX0081. Click to enlarge. BCX0081 aka “Chunky”. ID photos from DFO catalogue and Hildering. Not to be confused with “Vader”, aka BCX0989, who also has a distinct v-shaped marking (may the force be with you for this one). Click to enlarge. BCX0989 aka “Vader”. ID photo contributed to MERS by Jacqueline McGill. And then there are the more creative names, like “Niagara” for BCY0057 whose tail has a white spot shaped like a waterfall. Click to enlarge. BCY0057 aka “Niagara”. ID photos from DFO catalogue and Dr. Alexandra Morton. “Pulteney”, aka BCZ0297, has been named with the Pulteney lighthouse in mind. See the lighthouse on BCZ0297’s tail? Click to enlarge. BCZ0297 aka “Pultney”. ID photo contributed to MERS by Bruce Paterson. Sometimes, the name may seem even more like taking a Rorschach Test (ink blotch test). For example, see the shape of a bear’s head on the left part of “Yogi’s” tail (aka BCY0409)? Click to enlarge. BCY0409 aka “Yogi”. ID photo by Jim Borrowman, Stubbs Island Whale Watching. For the greater good, we often get local children involved in the naming and as a result have Humpbacks with highly creative nicknames like “Rocket”, “Sprinter”, “Hunter”, “Shark Tooth”, “Barracuda” and “Ashes”. Otherwise, it is the person who first shares the sighting of the whale with MERS that has the joy of suggesting a fitting nickname. Such was the case with Dave and Maureen. They were the first to photograph the whale below on July 19th and relay the sighting to MERS. It is a Humpback that we had not previously sighted in the area. Click to enlarge. Photo by Dave Towers, Seasmoke Whale Watching. See the dot-dot-dot-stripe on the tail? While “Dot-Dot-Dot-Stripe” is a very literal name, in musical notation for conductors “dot-dot-dot-stripe” signifies . . . da-da-da-dum. Da-da-da-dum! Like in Beethoven’s Fifth Symphony! Hence, there is now a Humpback whale nicknamed “Beethoven”. Thank you Dave and Maureen – a gold star to you! 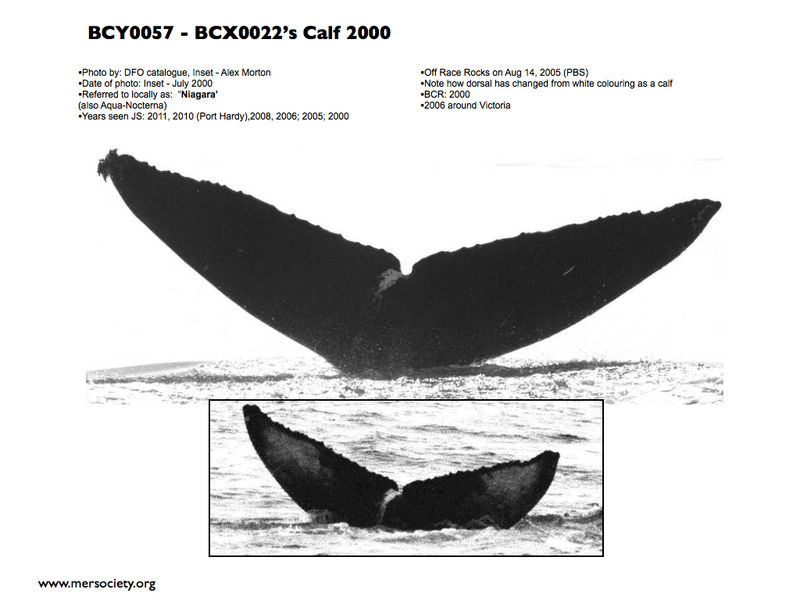 Note, regarding “uk” codes: Until 2010, Fisheries and Oceans Canada (DFO) ultimately assigned a catalogue number to Humpbacks in British Columbia. We at MERS contributed our data for this centralizing cataloguing and would assign a temporary “uk” (unknown) designation for whales not already in the DFO catalogue e.g. 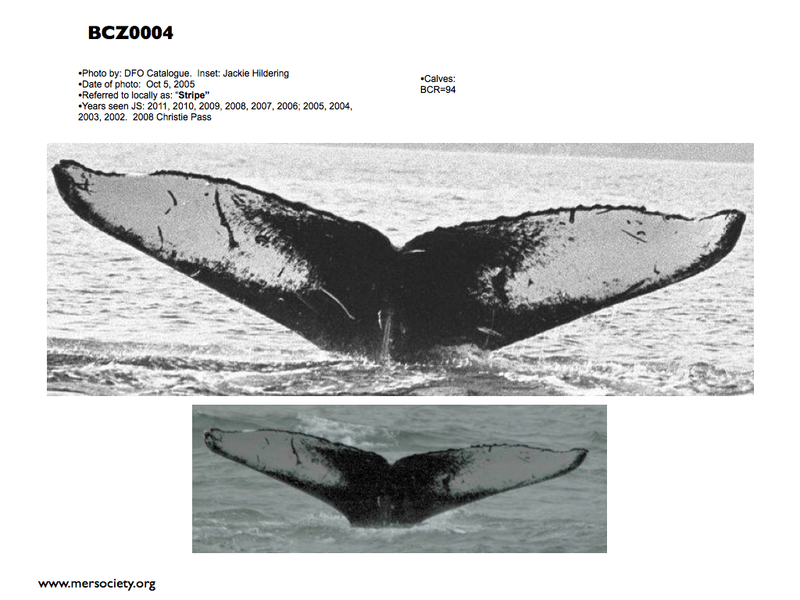 BCZuk2012#2 has a mostly black fluke, is not in the 2010 DFO catalogue, and was first documented by MERS in 2012. We are currently (2018) collaborating with colleagues to achieve an updated province-wide catalogue for Humpback Whales sighted off British Columbia’s coast. 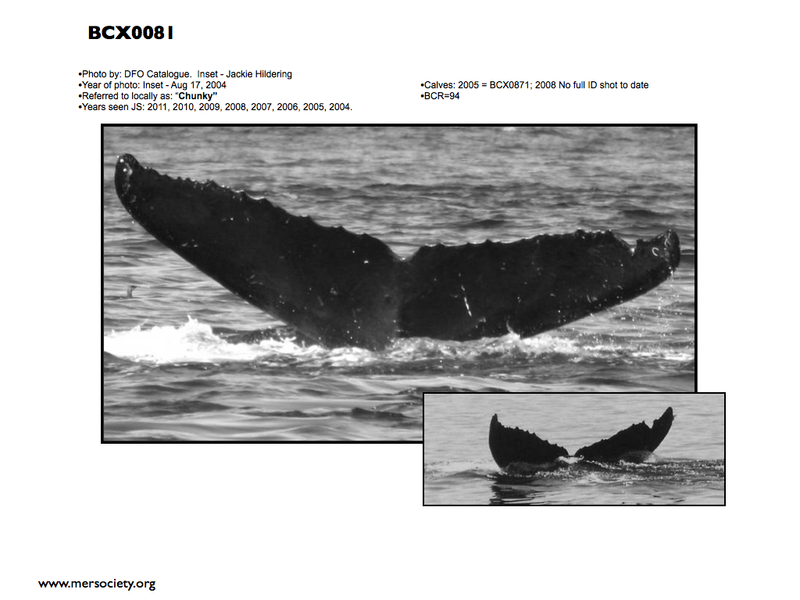 The MERS Humpback catalogue can be downloaded via this link. Very clever name! very interesting information too Jackie.